The Plains Apache are a small Southern Athabaskan group who traditionally live on the Southern Plains of North America, in close association with the linguistically unrelated Kiowa nation, and today are centered in Southwestern Oklahoma and Northern Texas. The tribe is federally recognized as the Apache Tribe of Oklahoma. Apache peoples, Navajo people, and other Athabascans. The Plains Apache are also known as the Kiowa Apache, Naʼisha, or Na i sha Tindé, meaning "Thieves" as the old meaning. However, in more recent times the negative meaning(thief) is trying to be replaced by just "Apache" for Na i sha." They also used the term Kalth Tindé or γát dìndé meaning "Cedar People" or Bá-ca-yé meaning "Whetstone People". To their close allies, the much larger Kiowa tribe, who speak a completely unrelated language, they were known as Semat meaning "Stealers." At major tribal events, the Kiowa Apache formed part of the Kiowa tribal 'hoop' (ring of tipis). This may explain why the Kiowa named the Kiowa-Apache Taugui meaning "Sitting Outside." Today the tribe is headquartered in Anadarko, Oklahoma. Their tribal jurisdictional area covers parts of Caddo, Comanche, Cotton, Grady, Jefferson, Kiowa, and Stephens Counties in Oklahoma. Their current tribal chairperson is Bobby Komardley. Tribal members must have a minimum blood quantum of 1/8 Plains Apache descent and at least 1/4 total Indian blood to enroll in the tribe. The Apache Tribe currently operates a casino. They also issue their own tribal license plates. In the early 18th century, the Plains Apache were living in the area of the upper Missouri River, already a band within the Kiowa nation, only differentiated by language and ethnicity. It is believed that the Plains Apache entered this alliance with the Kiowa for mutual protection against hostile tribes. It is recorded that many Kiowa Apache did not learn the Kiowa language, preferring to communicate with their allies using the sophisticated Plains Indian Sign Language, at which the Kiowa were past masters (having probably devised much of the system). Even before contact with Europeans, their numbers were never large, and in 1780 their population was estimated at 400. The Kiowa Apache and Kiowa had migrated into the southern plains sometime in the early 19th century. By the Treaty of Medicine Lodge in 1867 the Kiowa and Kiowa Apache settled in Western Oklahoma and Kansas. They were forced to move south of the Washita River to the Red River and Western Oklahoma with the Comanche and the Kiowa. The reservation period lasted from 1868 to 1906. The transition from the free life of Plains people to a restricted life of the reservation was more difficult for some families than others. The 1890 Census showed 1,598 Comanche at the Fort Sill reservation, which they shared with 1,140 Kiowa and 326 Kiowa Apache. Some groups of Plains Apache refused to settle on reservations and were involved in Kiowa and Comanche uprisings, most notably the First Battle of Adobe Walls which was the largest battle of the Indian Wars. It would be the last battle in which the natives repelled the US Army in the southern plains and marked the beginning of a decade long downfall for the southern plains tribes. The Kiowa Apache social organisation was split into numerous extended families (kustcrae), who camped together (for hunting, gathering) as local groups (gonka). The next level was the division or band, a grouping of a number of gonkas (who would come together, for mutual protection, especially in time of war). In pre-reservation times there were at least four local groups or gonkas who frequently joined together for warring neighbouring tribes and settlements. 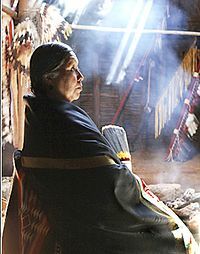 The Apache are linked to the Dismal River culture of the western Plains, generally attributed to the Paloma and Quartelejo (also Cuartelejo) Apaches. Jicarilla Apache pottery has also been found in some of the Dismal River complex sites. Some of the people of the Dismal River culture joined the Kiowa Apache in the Black Hills of South Dakota. Due to pressure from the Comanche from the west and Pawnee and French from the east, the Kiowa and remaining people of Dismal River culture migrated south where they later joined the Lipan Apache and Jicarilla Apache nations. The Kiowa Apache language is a member of the Southern Athabaskan language family, a division of the Na-Dene languages. The Plains Apache language, also referred to as Kiowa Apache, was the most divergent member of the subfamily. While three people spoke the language in 2006, the last fluent speaker died in 2008. Gonkon (Gonkan - "Stays in Tipi" or "Defends His Tipi", also known as "Apache John"). A shortened form of his full name Gon-kon-chey-has-tay-yah (Man Over His Camp). Koon-Ka-Zachey (Kootz-Zah). A shortened form of his full name Gon-kon-chey-has-tay-yah (Man Over His Camp). ^ a b c 2011 Oklahoma Indian Nations Pocket Pictorial Directory. Archived 2012-05-12 at the Wayback Machine Oklahoma Indian Affairs Commission. 2011: 5. Retrieved 2 Jan 2012. ^ Cassells, E. Steve. (1997). The Archeology of Colorado, Revised Edition. Boulder, Colorado: Johnson Books. pp. 236. ISBN 1-55566-193-9. ^ a b Gibbon, Guy E.; Ames, Kenneth M. (1998) Archaeology of Prehistoric Native America: An Encyclopedia. p. 213. ISBN 0-8153-0725-X. Beatty, John. 1974. Kiowa-Apache Music and Dance. Occasional Publications in Anthropology: Ethnology Series. Number 31. Greeley, CO: Northern Colorado UP. Bittle, William. 1954. “The Peyote Ritual of the Kiowa Apache.” Oklahoma Anthropological Society. 2: 69-79. ______. 1962. “The Manatidie: A Focus for Kiowa Apache Tribal Identity.” Plains Anthropologist. 7(17): 152-163. ______. 1963. “Kiowa-Apache.” In Studies in the Athapaskan Languages. (Ed. Hoijer, Harry). University of California Studies in Linguistics vol. 29. Berkeley: California UP. 76-101. ______. 1964. “Six Kiowa Apache Tales.” Oklahoma Papers in Anthropology. 5:8-12. ______. 1971. “A Brief History of the Kiowa Apache.” Oklahoma Papers in Anthropology. 12(1): 1-34. ______. 1979. “Kiowa Apache Raiding Behavior.” Oklahoma Papers in Anthropology. 20(2): 33-47. Brant, Charles S. 1949. “The cultural position of the Kiowa-Apache.” Southwestern Journal of Anthropology. 5(1): 56-61. Brant, Charles S. 1950. “Peyotism among the Kiowa-Apache and Neighboring Tribes.” Southwestern Journal of Anthropology. 6(2): 212-222. Brant, Charles S. 1953. “Kiowa-Apache Culture History: Some Further Observations.” Southwestern Journal of Anthropology. 9(2): 195-202. Brant, Charles S. 1969. Jim Whitewolf: The Life of a Kiowa Apache. New York: Dover Publications. Jordan, Julia A. 2008 Plains Apache Ethnobotany. University of Oklahoma Press. McAllister, J. Gilbert. 1937. “Kiowa-Apache Social Organization.” In Social Anthropology of North American Tribes. (ed. Eggan, Fred). Chicago: Chicago UP.99-169. _______.1949. “Kiowa Apache Tales.” In The Sky is My Tipi. (ed. Boatright, Mody). Dallas: SMU Press. 1-141. _______.1970. 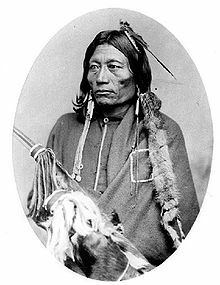 Dävéko: Kiowa-Apache Medicine Man. Austin: Bulletin of the Texas Memorial Museum, No. 17. Meadows, William C. 1999. Kiowa, Apache, and Comanche Military Societies. University of Texas Press, Austin. Opler, Morris E. (1969). Western Apache and Kiowa Apache materials relating to ceremonial payment. Ethnology, 8 (1), 122-124. Opler, Morris E; & Bittle, William E. (1961). The death practices and eschatology of the Kiowa Apache. Southwestern Journal of Anthropology, 17 (4), 383-394. Schweinfurth, Kay Parker. (2002). Prayer on top of the earth: The spiritual universe of the Plains Apaches. Boulder: University Press of Colorado.